Streams of the River: Not "either/or" but "both/and"
Because of the ecumenical experiences of my youth, and subsequent friendships and theological interests, I seem to have been blessed (or cursed - depending on how you look at it!) with a vocation of trying to get different kinds of Christians to appreciate the variety of gifts God has dispersed among his people. So it will not surprise you to know that I am at one with those who see the "arduous journey to Christian Unity" (John Paul II) itself as a "sharing of gifts." It seems to me that with the ecumenical journey now likely to be far longer than most of us imagined forty years ago, it is more and not less important for this sharing of gifts to take place along the way (without, of course, soft-pedalling the things that we believe). So, parishes need a multi-pronged approach to reaching people. Liturgical churches desperately need to be more evangelistic and cultivate deliberate Gospel ministry, as - in fact - did the Anglo-Catholic "ritualist" slum priests in their era. We must learn what we can from the “Fresh Expressions” crowd as well as from the various renewal movements. Christian people from across the traditions need to learn from each other innovative ways of sharing our faith with family members, with our colleagues at work and with our friends. But let’s also remember those – young and old alike - who need a bit of space as they begin to explore the life of faith. 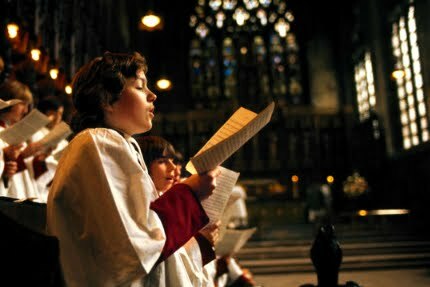 In this context one of the gifts the Anglican tradition has to share is sung Evensong in which the words of Scripture and the beauty of the music wash over us with their own healing power. It gives many their first vague feeling of connectedness with the things of God as well as a sense of being held in the circle of love by the community of faith. The numinous quality of this worship has enabled thousands to find God who would never have responded to a more aggressive evangelistic approach. Seasoned Christians, too, especially when going through turmoil or trauma in their lives, find enormous spiritual strength in Evensong. This past Sunday I went to Westminster Abbey to attend Evensong, their superb choir conducted by James O'Donnell and accompanied by Robert Quinney. Woven between Thomas Cranmer's matchless words was music of Herbert Howells, William Byrd and a sparkling anthem by Jonathan Dove. If you are visiting London and want a perfect slice of England there's no better place to go. The Church of England's evening service, adapted after the Reformation from the monastic hour of Vespers, is a wondrous phenomenon. Even the word 'Evensong' is poetic, and it seems to chime in perfect harmony with England's seasons: Autumn's melancholy, early evening light; the merry crackle of Winter frost; Spring's awakening, or the lazy, protracted sun strained through the warmed windows of a Summer afternoon. Evensong hangs on the wall of English life like a old, familiar cloak passed through the generations. Rich with prayer and Scripture, it is nevertheless totally nonthreatening. It is a service into which all can stumble without censure – a rambling old house where everyone can find some corner to sit and think, to listen with half-attention, trailing a few absentminded fingers of faith or doubt in its passing stream. Most religious celebrations gather us around a table of some sort. They hand us a book, or a plate, or speak a word demanding a response. They want to 'touch' us. Choral Evensong is a liturgical expression of Christ's Nolle me tangere – 'Do not touch me. I have not yet ascended to my Father' (St. John 20: 17). It reminds us that thresholds can be powerful places of contemplation; and that leaving someone alone with their thoughts is not always denying them hospitality or welcome.